Pacific Sharpnose Shark photographs © Andy Murch. All rights reserved world wide. Common Names: Pacific sharpnose shark. Identification: Long pointed snout. Slender body. Dorsal coloration is uniformly grey to copper brown above (without scattered white spots). Interdorsal ridge present. First dorsal starts directly above or just in front of free rear tip of pectoral fins. Second dorsal very low with long free rear tip. Pectoral fins with thin light/white posterior margin. White line also on posterior margin of lower caudal fin, sometimes inconspicuous. Upper caudal margin dusky or black. Long labial furrows. Size: At birth 31-34cm. Males mature at 93-96cm. Females mature at 83-95cm. Maximum size at least 129.5cm but possibly 154cm. 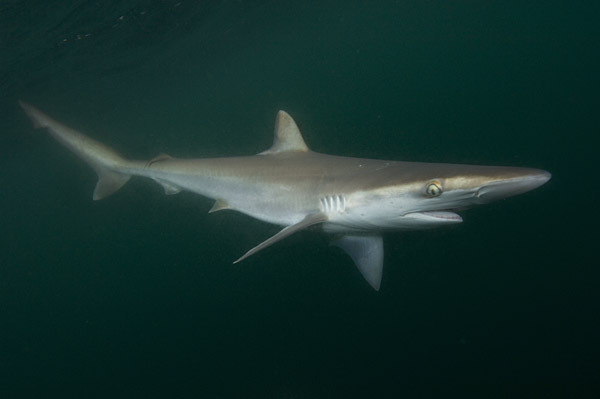 Habitat: Recorded as inhabiting depths from Intertidal to 27m but long liners in the Gulf of Mexico regularly fish for Pacific sharpnose sharks with bottom hooks set at 80m. Mostly over muddy substrate. Distribution: Eastern Pacific from Southern California to Peru including the Sea of Cortez. Abundance: Fairly abundant in the Sea of Cortez but heavily fished. Longline fishermen have reported significant declines. Anecdotally, in 2009 on one trip with shark fishermen from Mulege 1400 hooks yielded seven small sharpnose sharks compared to more than 1700kg in one day 20 years ago. IUCN not evaluated. Reproduction: Placental Viviparity. Litter size 1 to 12. 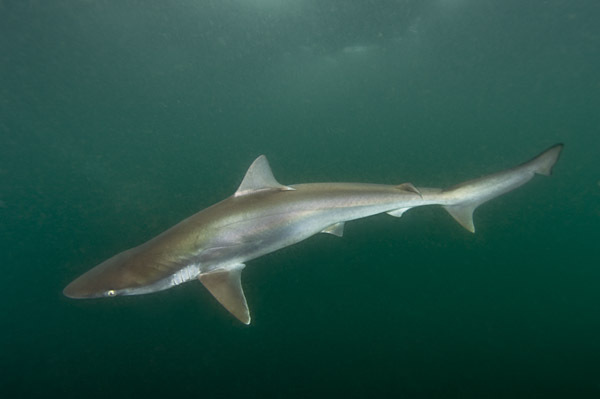 Unlike in the Atlantic sharpnose shark no correlation has been found between the litter size and size of the female. Average litter size 7.1. Diet: Small demersal fishes, cephalopods and crustaceans. Photographs: Sea of Cortez, Mulege, Baja, Mexico. These images were taken with the help of artesanal longline fishermen aboard a small wooden panga about 4km from shore. These are probably the first images of live, free swimming Pacific sharpnose sharks. Similar species: The Pacific sharpnose shark can be positively identified by location because there are no other sharpnose sharks along the Pacific coast of the Americas. Conceivably it is possible that some Caribbean and/or Brazilian sharpnose sharks have made their way through the Panama Canal. This has been documented in a number of species including some elasmobranchs. Reaction to divers: Rarely if ever encountered by scuba divers due to their timidity and preference for turbid water and sand/mud bottoms. Diving logistics: See reaction to divers above. Elasmodiver would be very interested in hearing about any natural encounters. Observations on the Biology of the Pacific Sharpnose Shark (Rhizoprionodon logurio, Jordan and Gilbert, 1882) Captured in Southern Sinaloa, Mexico. Marques-Farias, Corro-Espinosa & Castillo-Geniz 2005. Sharks of the World Leonard Compagno et al.